For 30 years we’ve been watching other countries pass us by, resulting in stagnant wages and loss of American jobs. Other countries have positioned themselves to be competitive through their tax policies. This is fine, this is what they're supposed to do. But since 1986 America hasn't done the same, leaving us at a disadvantage. There’s too many people in this country who feel left behind. They hear America is the land of opportunity but they just don’t believe it. This week House Republicans unveiled a bill that will give them a reason to believe. The Tax Cuts and Jobs Act is designed to boost our economy, which will create jobs and restore opportunity for Americans. This bill will give the average family of four back home over $1,100 back in taxes and give typical main street business $3,000 more to spend on operations like hiring workers or opening a new facility. Lowers individual tax rates for low and middle-income Americans. Eliminates the special-interest deductions that increase rates and complicate taxes. Significantly increases the standard deduction and establishes a new family credit. Repeals the death tax and alternative minimum tax (AMT). Preserves the home mortgage interest deduction. Reduces the tax rate on the hard-earned business income of Main Street job creators. Prevents American jobs, headquarters, and research from moving overseas. Lowers the corporate tax rate to 20 percent. The sole goal of this tax reform bill is to help American families, put American businesses on a level playing field, and restore opportunity for people now and for future generations. Read a summary, the full text of the bill, and a FAQ sheet here. 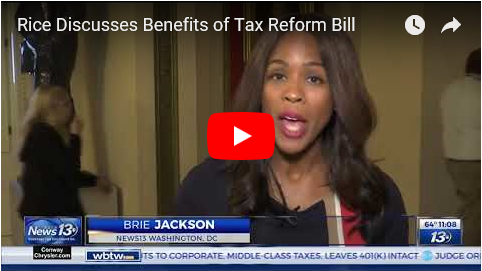 Also watch me discuss this bill with WBTW below! A reminder that if you suffered damages from Hurricane Matthew the deadline is quickly approaching to apply for funds to help rebuild. Many in the Grand Strand and the Pee Dee suffered great damages, and perhaps the hardest-hit was Marion County. In response, I'm proud of the fact that we were able to secure $95 million to help those residents recover. I know the road to recovery is long. If you are still in the recovery process, resources remain available through the South Carolina Disaster Recovery Office to help you rebuild. To schedule an in-person appointment, call 844-410-8560 or visit their website. You won't know if you are eligible for funds unless you apply, so I encourage you to do so! Please share with anyone you think may need assistance. The application period closes on November 10. Last week it was announced that 100 new jobs were coming to Dillon County. KB Biotech Solutions announced they would be opening a new facility near the site of the Dillon Inland Port and I was very excited to hear about this development, one I'm hopeful will be the first of many. This week I'm also excited to share good news for those in Horry County: 300 new jobs are coming! Greenwood Solutions based in California is a contract management company that announced plans to bring 300 new jobs paying $15/hr plus to our area. This new facility will also bring a $1.4 million investment in the area. 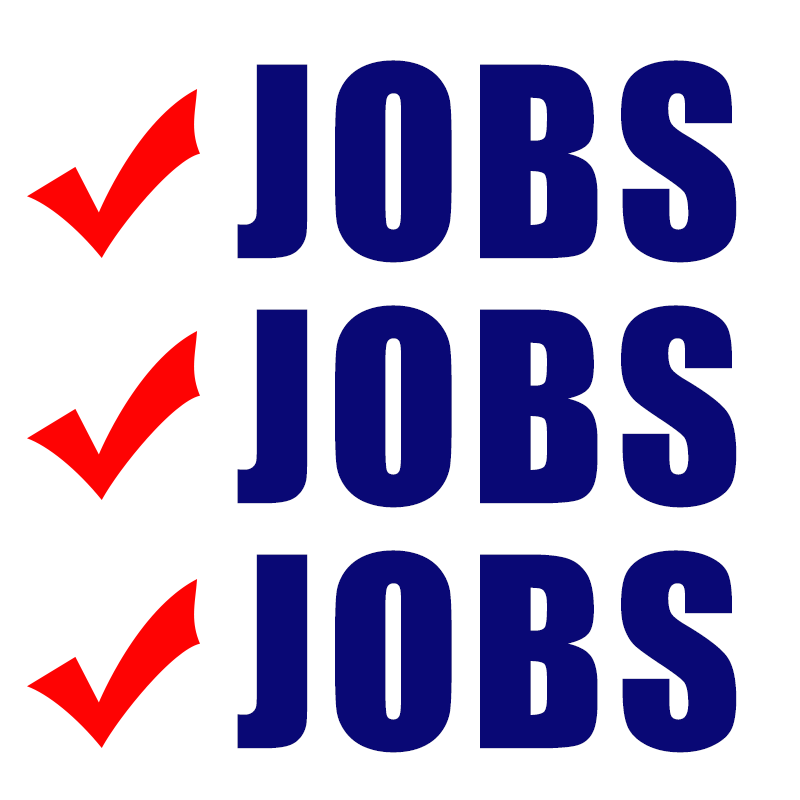 Jobs, jobs, jobs! America is the greatest country on earth. This coming Saturday we recognize all the brave men and women past and present who have put on the uniform of the United States military to defend our freedoms. As living citizens of the United States, I believe it is our duty to continue the fight servicemembers courageously fought. We must fight for liberty, freedom, and justice for all, so our children and grandchildren can live and prosper freely just as we have. News reporter Elmer Davis once said, “This nation will remain the land of the free only so long as it is the home of the brave.” I agree with Elmer Davis— we are truly the home of the free because of the sacrifices our brave military members have made. Without them we wouldn’t have a country. And for this we are forever grateful. 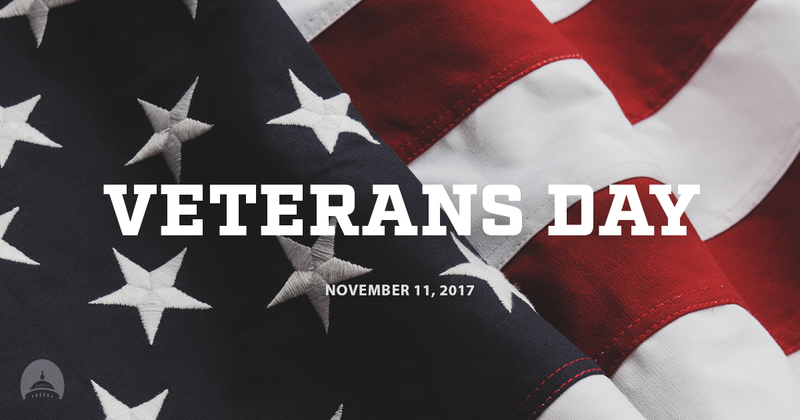 This week I encourage you to thank a veteran, show your support, and above all continue their fight so we can continue the legacy of liberty, freedom, and justice for all. When November rolls around, we think of Thanksgiving and the Holiday season. Halloween and the start of the school year are behind us and we look forward to sharing time with loved ones. For some, though, they don't have family nearby who they can share this time with. Fortunately, there are some in the community who want to help offer a free meal and some company to those who need it, making the holiday season a little brighter for everyone. Shepherd of the Sea Lutheran Church in Murrells Inlet offers free lunch every Wednesday for those who need a hot meal or to see some friendly faces. A free meal is a small gesture that can go a long way and it's uplifting to hear of the positive results this church has seen through this program.